CONDITIONS OF SALE: This painting must not be exhibited at the same time and in the same room as any of Jasper Johns&apos; works. STORY: This painting is, of course, an homage to Jasper Johns, but with several twists. 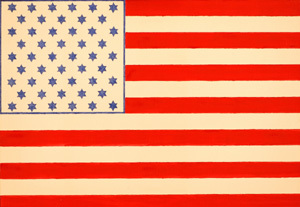 He reportedly painted his first American flag in 1954 after dreaming about it, just after returning from his military service in Japan. In those days the American flag was in many peoples&apos; minds a symbol of freedom, which justifies the title of the AbFab version in the age when this flag is associated with bullying and oppression. However, this painting is not using classical iconography in the way that Johns was, because pentagrams are replaced with hexagrams, suggesting that American freedom may have been corrupted by the Jewish lobby. Another difference from the American flag is that stars are blue on a white background, because white flags are commonly used as a symbol of truce or surrender. This is a reference to a homosexual relationship Johns had with a fellow artist Robert Rauschenberg, who was becoming openly gay after the end of his marriage and to whom Johns owes most of his early success. Johns was not allowed to be openly gay during his military service, as this has been grounds for discharge from the American military since the Revolutionary War. This policy was only changed in 2011, and in this same year Johns received the Presidential Medal of Freedom, becoming the first painter or sculptor to receive this honor since 1977. The price of this AbFab painting refers to the experts&apos; estimate the Metropolitan Museum of Art in New York paid in 1998 for Johns&apos; White Flag of 1955. Note that one of unofficial flags of St Martin, where Johns currently lives, is also principally white. The preferred buyer for this AbFab work is the current owner of Johns&apos; Flag of 1954.